Mathematics Dreaming - From Rational to Real : PROOF: What Do You See? How do You Know? PROOF: What Do You See? How do You Know? Mrs P, will you be my maths teacher forever? I've always hated math, but with you I not only seem to like it, but I get it as well. I am making connections that are really cool! Even better, the rest of the class joins in on the discussion. This is the same week that I returned the Year 9 exam, discussed as a whole class how to critically reflect on their exam results and use their exam as a point of growth for Year 10. It was also after teaching the skill of factorising by grouping in pairs, and then refactorising by finding the common algebraic expresson factor. I am pretty stoked if a student came out of that lesson feeling proud! 'Learning how to Learn - powerful mental tools to help you master tough subjects"
delivered by Dr Barbara Oakley, Professor of Engineering at UC San Diego. Since taking this course, I make teaching the strategies for learning a part of my weekly lesson, revision, and student learning objective. Many of the students I teach are surprised that there are actually techniques that they can apply to improve their learning. Once they realise that they can actually learn, the growth mindset begins, and successful learning follows. This blog post is dedicated to many of you - my online community - who share with me your best tools for learning. The Coursera course is just one element of professional learning that has improved me as a teacher. This week, I was able to use a number of other resources shared by YOU. It took a while, but in their groups, they started to recall prior learning. And they appreciated having the first couple of lessons just to review the technical language for angles on parallel lines and triangle properties. The learning was helped by this contribution from David Wees, Formative Assessment Specialist at New Visions for Public Schools who, with his team provided a simple visual representation for proving the angle sum of a triangle. 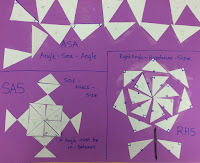 This activity proved a nice challenge because it used algebraic representations of angles. When trying to work out each of the missing angles, some of the students who had prior knowledge of the angle sum of a triangle tried to use that - but I clarified that they could not, as they had yet to 'prove' the angle sum of a triangle was 180 degrees. The foundation notion of 'what is proof' was set. Within the geometry unit, we went on to even more exciting lessons that involved extensive discussion, conjecture, and debate. Scootle provided the next learning activity with its 'Quadrilateral Explorer' interactive. I like to use this interactive to generate small group sharing, followed by whole class discussion. The Scootle 'Quadrilateral Explorer' activity has never failed to generate intense discussion, confusion, and then clarification on the properties that define specific quadrilaterals, and why a square is a rectangle but a rectangle is not a square! Prove the conditions for triangle congruence (SSS, RHS, SAS, AAS) by construction and comparing (students love a measurement cut and paste activity). 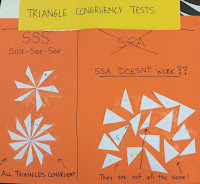 This activity also produced the counter example proof that SSA was NOT a condition for the congruence of two triangles. All in all, I think my students have had a range of learning activities during this 12 lesson module that allowed for learning maths using tools, concrete materials, small group sharing, whole class discussion, challenge, confusion, resolution, collaboration, and visual representation. The learning focus of reasoning geometrically about properties of triangles and quadrilaterals using by connecting prior learning with precise mathematical language to build new learning was achieved - and it was a lot more fun than standing at a chalkboard! Why now? Reflections and a call for your advice!